Because of the wartime difficulties of the Horseshoe Route and the suspension of the London-Cairo section, a large quantity of N.Z. mail was now being flown on the Pan American Airways Pacific service. The N.Z. 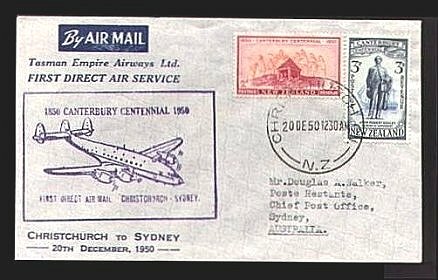 Post Office reduced the N.Z.-U.K. air mail rate for standard half ounce letters from six shillings and threepence to five shillings and ninepence with the first mails at this rate being flown from Auckland by the PAA Boeing 314 NC-18602 "American Clipper" commanded by Captain K.V. Beerland. From this date special lightweight Forces Christmas Cards were made available for posting from the Middle East at the concession rate of 5d (5 cents). These cards had to be posted by 2 December 1941. Internal Flight: 1941, 6 Oct.
To include San Pedro, California, and Suva, Fiji. The first flight was made by PAA Boeing 314 NC-18609 "Pacific Clipper" commanded by Captain John H. Tilton. Cachets were supplied by the US. Postal Departments New Caledonia Postal Administration, Fiji Post Office and the N.Z. Post Office. By Pan American Airways Boeing 314 NC-18609 "Pacific Clipper" commanded by Captain John H. Tilton. Note: These flights crossed the International Date Line. Internal Flight: 1941, 20 Nov.
By Boeing 314 NC18609 "Pacific Clipper" (Captain Robert Ford). After the Japanese attack on Pearl Harbour the Clipper was ordered to return to the USA avoiding hostile areas, and so left Auckland on 15 December for Noumea, Gladstone (Australia) and Darwin. From there the Boeing continued to Surabaya (Netherlands East Indies) and Trincomalee, Ceylon. It left Ceylon on 24 December, only to be forced to return by engine trouble but was able to take off again for Karachi on the 26th. "Pacific Clipper" flew on to Leopoldville in the Belgian Congo via Oman, Bahrain and Khartoum. The South Atlantic was crossed after a 23hour flight to Belem, Brazil, from whence the Boeing continued to Trinidad and on 8 January alighted at the Pan American Marine Terminal, La Guardia Airport, New York after a journey of 34,000 miles in 22 days. 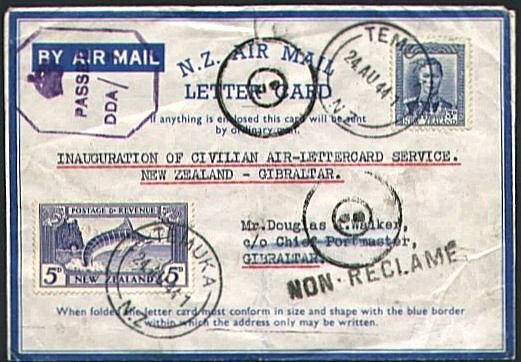 Mail has been seen postmarked in New Zealand from 5 to 14 December endorsed 'Per Clipper' but it has not been confirmed that this mail was carried on the "Pacific Clipper" flight. This flight was the first occasion on which a commercial aircraft had circumnavigated the world. Consolidated PB2Y-2 Coronado flying boat. This aircraft probably carried the US South Pacific Commander, Vice-Admiral Robt. L Ghormley, U.S. Navy, and senior officials to New Zealand prior to the opening of Naval Command Headquarters in Auckland on 8 May. The US. Naval P.O. opened there on 15 July 1942. These flights continued regularly and mails were carried. By Pan American Airways on behalf of US. Naval Air Transport Service using a Martin PBM-3 Mariner flying boat "Philippine Clipper", commanded by Captain John H. Tilton. A few of the covers carried "by courtesy" were posted at ENMORE NSW 25E 42 and again on arrival at Auckland, where they were postmarked AUCKLAND 3 SEPT 42 while another has only the Auckland postmark. This flight was part of a survey undertaken for NATS from Hawaii-Palmyra-Canton Is.-Wallis Is.-Fiji-Noumea-Australia-N.Z. and although four PAA Captains were aboard the Martin, it is understood the Australia-N.Z. flight was commanded by Captain Tilton. This service to Auckland commenced in September 1942 and ceased early in 1946. Inaugural flight by South Pacific Combat Air Transport Service (SCATS). Forward Headquarters for the South Pacific Command was established at the Plaine des Gaiacs, 180 miles from Noumea, and an airfield was constructed during June and July. SCATS began a regular service to Auckland in September carrying US Forces mail in each direction. In November 1942 arrangements were made for NZ Forces mail to be carried on this service. US Naval Air Transport Service (NATS) inaugurated a daily Douglas R4D Skytrain service carrying US Services mail which was handled through US. Naval P.O. 132, Auckland. Arrangements were made for N.Z. Forces mail to be flown on this service. Internal Flight: 1942, 21 Dec.
Whenuapai-Norfolk Island and return. Although the airfield on Norfolk Is. was still under construction there are definite reports of flights to and from the island by a RNZAF aircraft. Small mails were carried in each direction with mail from Norfolk Is. bearing the APO markings. Flight by RNZAF Lockheed Hudson carrying a small mail for the N.Z. contingent stationed on the island. Mail was also carried on the return flight to RNZAF Station, Whenuapai but few covers exist. Internal Flights: 1943, 5 Feb. / 1943, 9 Feb. / 1943, 11 Feb.
Auckland-Norfolk Island-New Caledonia-New Hebrides-Fiji-Norfolk Island-Auckland with a Douglas C-47 Dakota carrying mail and supplies to N.Z. Forces in the Pacific. Identification of covers is extremely difficult. Survey flight by RNZAF Douglas C-47 Dakota (Squadron Leader FJ. Lucas) carrying 11 passengers and probably mail. The C-47 left Whenuapai at 6.15am on 13 April and returned at 3.15pm the following day. First flight by RNZAF Douglas C-47 Dakota NZ3501 (Sqn. Ldr. F.J. Lucas). After arriving at Nandi Sqn. Ldr. Lucas took part in a search for a suspected enemy submarine before returning to Whenuapai on 14 June. N.Z.-PACIFIC ISLANDS INAUGURAL FLIGHT "ISLANDS MAIL SERVICE"
(Later Schedule 4) by Lockheed Hudson NZ2022 of No 1 Bomber Reconnaissance Squadron, RNZAF (Flying Officer John Coom). After approaches by the N.Z. Post and Telegraph Department on 26 April, the RNZAF agreed to commence the service on the 31 May with No 1 BR Squadron (later flown by No 2 Squadron) pending the formation of No 40 (Transport) Squadron. The route was Whenuapai-Norfolk Is. (NZEF APO 400, RNZAF APO 350)-Tontouta (NZEF APO 150)-Espiritu Santo (RNZAF APO 246, 361) and mail for Guadalcanal (RNZAF APO 351, 366)-Nausori (NZEF APO 250 and RNZAF APO 311, 315, 351, 381) and mail for Tonga (NZEF APO 200)-Norfolk Is.-Whenuapai. It is known that 19 bags of mail were flown from New Zealand to New Caledonia but no records are available of other quantities. On 5 June Hudson NZ2083 (Flying Officer J.N.E. Thomas) left Whenuapai on the second flight of the service. VISIT OF RAF AVRO LANCASTER ED930 "QUEENIE VI"
(Flight lieutenant P.S. Isaacson). On board as a passenger was Lord Burghley, representing the British Government. The Lancaster left the U.K. on 22 May and flew via the Atlantic, Canada, the USA, the Pacific and Australia in seven stages. The final stage was from Melbourne to Auckland on 11 June. It is reported that mail was flown across the Tasman but no special markings were applied. Leaflets in support of the Third Liberty Loan were dropped over a number of New Zealand cities. They could be redeemed for a Bond worth one pound. The Lancaster made a direct Auckland-Melbourne flight on 19 June, 1943. First flight by C-60 Lodestar NZ3507 (Flying Officer W.B. Pettet) The aircraft took off on the 26th but was forced to turn back by bad weather. The Lodestar left again the following morning. At this time NZEF APO 400 and RNZAF APO 350 were in use. Schedule operated by the RNZAF was extended northward to Guadalcanal and included mails to New Georgia. However the leg to Nausori in Fiji was deleted because of the small volume of mail. The recognised service commenced with a Lockheed C-60 Lodestar (Flight Lieut. Prior) of No 41 (Transport) Squadron, RNZAF. Mail from Guadalcanal bore NZAPO 250 or RNZAF APO 566 (datestamp C) and New Georgia mail was struck with RNZAF APO 308 (datestamp D). Internal Flight: 1943, 1 Nov.
To include New Georgia in the Solomon Islands. Inaugurated by Lockheed C-60 Lodestar commanded by Flight lieutenant Prior. This extended the RNZAF service to New Georgia (RNZAF APO 308 datestamp D). Weekly service each Tuesday by Douglas C-47 Dakota of No 40 (Transport) Squadron RNZAF carrying mail, freight and personnel. Mail from Fiji bore one of these markings - NZEF APO 250, RNZAF APO 311 or RNZAF APO 381 (datestamp A). Internal Flights: 1944, 2 Mar. / 1944, 7-10 Mar. Service opened by South Pacific Combat Air Transport Service (SCATS) by US Army Air Force. Mail and supplies were flown between the US Forces in New Caledonia and New Zealand. Mail into New Zealand from New Caledonia averaged about 4000-5000 pounds monthly but decreased as the 3rd and 2nd Marines were withdrawn. It increased again when the 25th Infantry Division arrived to reach a peak of 9500lbs in January, 1944. When the division was withdrawn mail volumes declined. The mails from New Zealand to New Caledonia were usually only 200-400lbs. Was commenced from RNZAF Station. Whenuapai to N.Z. Forces stationed in Fiji and Western Samoa. Covers are difficult to identify. Inauguration of civilian lettercard service. Internal Flight: 1944, 6 Nov.
By Consolidated RY-3 Liberator AL504 "Commando" of RAF Transport Command. Mail was carried from RNZAF Station, Whenuapai for NZ servicemen in Montreal. No special markings were applied and few covers are known. Returning to New Zealand on 26 November by RNZAF Lockheed Lodestar (Wing Commander LF.P. Taylor), Covers noted datestamped 20 to 23 November and backstamped at Rarotonga on the 24th. Flights by Lockheed Hudson NZ2075 (Warrant Officer L. Bary). Supplies and mail were carried to the RNZAF contingent and returning mail was struck with the RNZAF APO 348 and the H. datestamp. Further direct flights were as follows. Internal Flights: 1945, 24-28 Jan. /1945, 22-23 Feb. / 1945, 26-28 Mar. / 1945, 26-28 Mar. / 1945, 14 Apr. Commanded by Captain R.G. Buck on a proving flight left Hum on 23 April and landed at Ohakea on the 27th in a flying time of 60 hours. A few covers, two of which were posted at Palmerston North after arrival, were carried unofficially. (Revised Schedule 1) commenced by Douglas C-47 Dakota NZ3540 of No 41 (Transport) Squadron (Flight Lieut C.P. Towsey). Flights left Whenuapai on Tuesday, Friday and Sunday and flew via Espiritu Santo (APO 361)-Guadalcanal (APO 366)-Espiritu Santo-Whenuapai. This service ceased about November, 1945. Inaugural Mail Service flight by Douglas C-47 Dakota NZ3536 (Flight Lieut D.W. Lockhart). When the RNZAF Base was moved forward from Espiritu Santo, New Hebrides to Bougainville in the Solomon Islands, Schedule 7 was replaced by Schedule 7A and the flights left Whenuapai each Tuesday and Sunday. The route was via Espiritu Santo (APO 361)-Bougainville (APO 308)-Espiritu Santo-Guadalcanal (APO 366)-Espiritu Santo-Whenuapai. Internal Flights: 1945, 5 Aug. / 1945, 20 Aug.
To evacuate New Zealand prisoners of war from Singapore to New Zealand. On 4 September two C-47 Dakotas, NZ3536 (Flight Lieut Mounsey) and NZ3540 (Flight Lieut Spicer) left Whenuapai for Singapore followed by these further flights. The first return flights left Singapore on 15,16, and 17 September and the final flight departed on 17 October. 156 New Zealanders and 2 Australians were evacuated by this service. Mail was flown to Singapore on these flights and probably on the returning aircraft. By RNZAF Catalina flying boat. Small mails were carried. By Douglas C-47 Dakota NZ3546 (Wing Commander L.H. Parry) of No 41 Squadron. RNZAF, The flight was made as a preliminary of a regular service to the occupation force in Japan. The route was Whenuapai-Norfolk Is.-Brisbane-Cloncurry-Darwin- Morotai-Manila-Okinawa-Iwakuni. The Dakota left Whenuapai on 6 March and arrived back there on the 28th. Mail was carried and a small quantity of covers were hand datestamped WELLINGTON C.1 1 MARCH 46 and backstamped in Japan -NZ APO 222 17.3.46.1. Avro Lancastrian C.MkII VM726 of No 24 Squadron, RA.F. Transport Command (Squadron Leader U. Adams) undertook a proving flight from the U.K. to N.Z. and landed at Ohakea on 9 March. It carried a few unofficial covers which were posted at the Chief Post Office, Palmerston North on the same day. Some covers carried on the return flight were posted at Palmerston North on the 10 and 11 March and again in London on 12 and 14 March. Very few covers flown. Internal Flights: 1946, 16 Mar. / 1946, 28 Mar. Civilian service inaugurated by the RNZAF linking Auckland-Norfolk Is-Tonga-Western Samoa by a return weekly service and Auckland-Aitutaki-Rarotonga by a return fortnightly service. The N.Z. terminal was RNZAF Station, Whenuapai. It is believed small mails may have been carried but no covers have been examined. Internal Flight: 1946, 8 Apr. Return flight by RNZAF Catalina flying boat Public Works Department staff engaged in construction work at the sub-Antarctic meteorological base were flown to Campbell Island. Three letters were handed to the crew of the Catalina, but instead of being posted they were delivered by hand to the addressee by members of the PWD Wellington staff after being endorsed with the flight details. They also bear a backstamp reading "Wellington, Public Works Department 2 May, 1946". The Catalina left Campbell Island for Bluff on the 1 May where it arrived at 3.25pm. It left Bluff at 12.45pm on 2 May and arrived in Wellington at 4.00pm. Flight by RNZAF Sunderland flying boat NZ4103 "Mataatua" from Evans Bay, Wellington to Te Whanga Lagoon on behalf of the N.Z. Government Department of Island Affairs. Passengers and mail were carried in each direction. Sunderland flying boat NZ4102 "Tokomaru" to Lauthala Bay returning to Auckland on the following day. Mails and passengers were carried on each flight. Of the Tasman Empire Airways Ltd Short S.25 Sandringham Mk.4 flying boat, ZK-AMB "Tasman" which was flown to Sydney by Senior Captain B. Travers of BOAC, At Sydney Captain A.V. Jury took command and completed the flight to Auckland. It is believed that a small number of covers were flown unofficially. VISIT OF THE AVRO LANCASTER PD328 "Aries"
(Squadron Leader J.E. Aldridge) of the Empire Air Navigation School, RAF Shawbury, on a long distance navigational exercise. The visit was also treated as a "Goodwill Flight" as the U.K. Minister of Food had written a letter of gratitude to the Prime Minister of New Zealand thanking him for support in the "Food For Britain" campaign. This letter was reprinted in the form of a leaflet, copies of which were dropped from the Lancaster over several cities. "Aries" made the flight from the U.K. to N.Z. in 59 hours 51 minutes. The modified Lancaster flew over Wellington before landing at RNZAF on Ohakea. Introduced the Short S.25 Sandringham Mk.4 flying boat ZK-AMD "Australia" on the Trans Tasman service under the command of Captain A.V. Jury with First Officer J.H. McGrane. Internal Flights: 1946, 2-3 Sept. / 1946, 2 Sept. / 1946, 4 Sept.
First service flight of the Tasman Empire Airways Short S25 Sandringham 4 flying boat ZK-AME "New Zealand" commanded by Captain J.R. McGrane with First Officer P.J. La Couteur. Special flight by RNZAF Sunderland flying boat NZ4103 from Evans Bay to Te Whanga Lagoon with passengers and mail. The return flight was made the same day. Internal Flights: 1946, 2 Dec.
Tasman Empire Airways Ltd introduced its fourth and last Short 5.25 Sandringham flying boat ZK-AMH "Auckland" (Captain PJ. La Couteur, First Officer F.D. Bethwaite) to the trans-Tasman route. RAAF Mosquito A52-101 (Flight lieutenant LP. Bond, pilot and Flight lieutenant L.C. Lobb, navigator) in a record time for a trans Tasman flight of 3 hours 45 minutes. 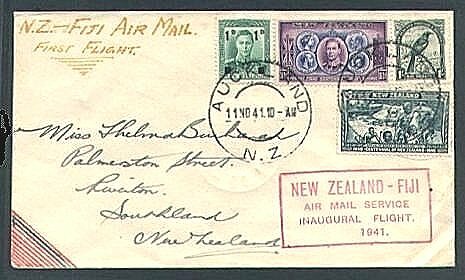 12 covers were flown unofficially, postmarked at Auckland F.M.B. 19 DEC 46 11.30. and signed by pilot and navigator. Internal Flights: 1947, 20 Jan. / 1947, 22 Jan.
Service of N.Z. NAC was extended to Noumea, New Caledonia and Papeete, Tahiti. A Douglas C-47 Dakota of No 41 (Transport) Squadron RNZAF carrying freight and mail to the N.Z. Jayforce made a forced landing at Sourabaya, Java, without permission. The Indonesian authorities detained the aircraft for three days before allowing it to proceed to Japan. No distinctive markings were applied to the mail. British Commonwealth Pacific Airlines (BCPA) inaugurated its trans Pacific service on 25 April, when Douglas DC-4 VH-AND "Tatana" (Captain P.C. Taylor) chartered from Australian National Airways left Whenuapai at 9.15am with 31 passengers and mail. BCPA produced special covers, which were carried together with some privately printed but no cachets were applied. The return flight of the fortnightly service took place on 2 May when the chartered DC-4 VH-ANA "Amana" left Vancouver for Auckland where it arrived on the 3rd. Brought Field Marshall The Viscount Montgomery on a visit to Australia and New Zealand. At least 3 covers are known to have been flown unofficially to N.Z. They were posted MASCOT JLY 47 in Australia and backstamped upon arrival in NZ at OHAKEA AIR FORCE. After being back to Australia in the York, the covers were backstamped MASCOT AERODROME. The entire crew of the York signed the covers. Emergency flight by RNZAF Catalina flying boat to bring the seriously ill resident Doctor D.J. Patterson to Wellington, The aircraft left Evans Bay, Wellington on 20 July with the relieving Medical Officer, Dr Gresson and mail, alighting on Te Whanga Lagoon in the Chathams, Mail was also carried on the return flight. Internal Flights:1947, 3 Aug. / 1947, 1-2 Sept. / 1947, 23-24 Sept. / 1947, 23-26 Sept. / 1947, 25-26 Sept. / 1947, 26-27 Sept. / 1947, 27 Sept. / 1947, 29 Sept. / 1947, 30 Sept. / 1947, 1-2 Oct. / 1947, 1-3 Oct. / 1947, 1-6 Oct.
Harry Newton had flown his Belgian registered Ercoupe 415C-1 OO-EXC "Petit Pegase" from Belgium to Australia. He flew across the Tasman Sea from Coffs Harbour, stopping briefly at Lord Howe Island and reaching Auckland the same day. It is thought that a few unofficial covers were carried. N.Z. National Airways inaugurated a Pacific Island service by Short Sunderland flying boat ZK-AMG "Mataatua" (Captain RH. Makgill). First NZNAC service by Douglas DC-3 ZK-APB "Popotea" (Captain M.L Pirie). Final flights of the Short S-30 Empire flying boat ZKAMA RMA "Aotearoa" after seven and a half years trans Tasman service and flying over one and a quarter million miles. Privately primed covers were carried on the last flights. U.K.-N.Z, FLIGHT OF THE ROYAL AIR FORCE Lincolnian RE364 "Aries II"
From the Empire Air Navigation School, Shawbury, Shropshire, with the deputy-commandant of the school, Group Captain E.E. Vielle. Leaflets were dropped over some places in N.Z. An unofficial cover carried from Ohakea to Wigram were postmarked PALMERSTON NORTH 13 NOV 478-PM and signed by seven members of the crew. Covers may also have been carried 'by courtesy' on other stages. (Fiji) -Nukualofa (Tonga) -Faleofa (W. Samoa)-Aitutaki (Cook Is).-Rarotonga and return fortnightly service by NZNAC. Internal Flight: 1947 17 Nov.
By RNZAF Catalina flying boat (Flight Lieutenant P.J. Warner) which flew Auckland-Evans Bay, Wellington-Te Whanga Lagoon, Chatham Islands to pick up a sick child. The aircraft returned to Evans Bay with the child. Mail was carried. When Douglas C-47 Dakota NZ3558 (Flight Lieut L.K. Burch) experienced engine trouble about 300 miles north of Manila. Flight was maintained on one engine but bad weather and turbulence forced NZ3558 to below 1000 feet. At about 100 miles from Manila some personal baggage and mail was jettisoned. A 'wheels up' landing was made at Dila Longan on the east coast of Luzon in the Philippines about 75 miles north of Manila. Three passengers were injured and all were rescued by a relief aircraft. Four bags of mail and some personal luggage was saved. Special flight by Tasman Empire Airways flying boat. Withdrew its Short Sandringham Tasman Class flying boats from service after the discovery of engine faults. During the following period until the Sandringhams returned to service TEAL chartered various aircraft to maintain the Trans-Tasman service. Covers were carried but these can usually only be identified by the date of the postmark. 23 March. An RNZAF Dakota of No 41 Squadron carried a special mail of about 22,000 pieces. weighing 240 pounds, Auckland-Sydney. This included 59 pounds for Norfolk Is and J Force and 181 pounds for Australia and the U.K.
(Captain C. Griffiths) resumed the TEAL trans-Tasman service. NOTE: Flights by the BOAC Sandringham G-AGJL "Hobart", the NZNAC Sunderland ZK-AMG "Mataatua" and the TAA Skymaster were also made independently of the TEAL charters. DOUGLAS DC-4 N37734 "ATLAS SKYMERCHANT"
(Colonel E.E. Aldrin) arrived at Whenuapai during a world tour to investigate business conditions and promote sales of the products of Atlas Supply Co. of Newark, N. J. It had started on 13 Jan 1948, and was described as a 'Flying Showroom'. A few covers were flown "by courtesy" from Auckland to New York. Internal Flights: 1948, 5 Apr. / 1948, 8-9 Apr. / 1948, 16 Apr. / 1948, 19 Apr. / 1948, 27 Apr. First flight by British Commonwealth Pacific Airlines (BCPA) under the full administration of the Airline. Douglas C-47 Dakota NZ3546 (Wing Commander LH. Parry) No 41 Squadron, RNZAF carried out the final flight of this service to N.Z. Forces in Japan after more than l00 flights by the same aircraft. As well as mail the aircraft carried a spare engine for No 14 Squadron. Mail was also carried on the return flight from Japan to N.Z. RAAF PBY-SA Catalina amphibian A24-104 (Flight Lieutenant P.E. Delahunty) left Hobart, Tasmania on 4 August, reaching Macquarie Island in the early afternoon. As the Catalina had insufficient fuel to return to Tasmania, it diverted to RNZAF Station, Wigram, Christchurch, where it arrived at l2.45am on 5 August. It left Wigram on 5 August and flew direct to Rathmines, Australia. A few privately printed covers plus a few with the cachets OPERATION SINBAD and RAAF No 11 SQUADRON PT COOK, VICTORIA were carried. Internal Flights: 1948, 9 Aug. / 1948, 9 Aug.
By Charles Kingsford Smith in the "Southern Cross". Privately prepared souvenir covers were flown on the TEAL scheduled flight to mark the occasion. Internal Flights: 1948, 27 Sept. / 1948, 23 Oct. / 1948, 19 Nov. / 1948, 13 Dec. / 1948, 15 Dec. / 1948, 20 Dec. / 1948, 20 Dec.
By NZNAC Sunderland flying boat which flew from Auckland-Wellington (Evans Bay)-Chatham Is (Te Whanga Lagoon) and return to Evans Bay carrying passengers and mail. Pan American Airways extended its Trans Pacific service to New Zealand (F.A.M. 19) by commencing at Seattle, Washington, calling at Honolulu. Canton Is, Suva and Auckland. Mail from Tacoma was dispatched through Seattle Airfield and is classed equally with Seattle postings. No mail was flown between Seattle and Portland and no mail was carried between Auckland and Suva on the return flight. No special cachets were applied. Internal Flight: 1949, 18 Mar. By a Catalina flying boat of No 5 Squadron RNZAF (Flight lieutenant G. Hutton) on behalf of the Department of Island Territories, Passengers and mail were carried from Evans Bay. Wellington, to Te Whanga Lagoon in the Chathams, as well as on the return flight the same day. Internal Flight: 1949, 4 May. (Kermadec Islands) emergency flight by RNZAF Catalina flying boat to pick up a seriously ill member of the meteorological staff on the island. Mail was flown in each direction. Commenced by Canadian Pacific Airlines (CPA) using the Canadair C-4 CF-CPI, "Empress of Sydney", the route being Vancouver-Honolulu-Canton Island-Suva-Auckland. A large cachet was applied to mail in Vancouver. Flight by Catalina flying boat of No 5 Squadron, RNZAF (Flight Lieutenant D.B. Flintoff). The aircraft flew from Evans Bay, Wellington to Te Whanga Lagoon with passengers and mail. Two injured men, Messrs J.R Kennedy and E.R. Gilsenan of the Public Works Department, were brought back to Wellington for treatment. Internal Flight: 1949, 11 Aug.
Of Tasman Empire Airways first Short S-45 Solent Mk 4 flying boat ZK-AMM "Ararangi" (Captain C. Griffiths). No official mail was flown but covers may have been carried "by courtesy". The French regional airline TRAPAS (Societe Francaise de Transports Aeriens du Pacific Sud) established connecting flights between Papeete, Tahiti and the British Commonwealth Pacific Airlines service passing through Nandi. Internal Flight: 1949, 31 Oct.
First service flight of the Tasman Empire Airways Short 5.45 Solent 4 flying boat ZK-AMM "Ararangi" (Captain A.V. Jury). First flight Tasman Empire Airways Short 5.45 Solent 4 ZK-AMN "Awatere" Captain C. Griffiths) on the Trans Tasman service. Of Tasman Empire Airways Ltd Short S.45 Solent 4 flying boat ZK-AML "Aotearoa II" (Captain LC. Patterson and Captain PJ. Le Couteur). A few covers were carried by courtesy on the flight from the U.K. The trans-Tasman crossing was made in 5 hours 37 minutes. First service by TEAL Short S.45 Solent 4 ZK-AMO "Aranui" (Captain D.W. Keesing). By Short S.25 Sandringham ZK-AME "New Zealand" (Captain P.J. Le Couteur, Captain LH. Parry) before being sold to Barrier Reef Airways, Queensland, as VH-BRD. By Tasman Empire Airways Short S.45 Solent 4 ZK-AML "Aotearoa II" (Captain J.R. McGrane). NZNAC had previously operated the "Hibiscus Route" with the Douglas DC-3 on behalf of TEAL, but with the introduction of the Short S.45 Solent flying boats TEAL took over the service. Captain A.J. Bradshaw together with his wife and young son had flown his Percival Proctor 5 G-AHWW "Kiwi Wanderer" from England and had planned to continue his flight to N.Z. The Australian Civil Aviation authorities would only permit him to fly the Tasman alone, so, leaving Coffs Harbour on 28 June he flew to Norfolk Island where he stayed the night and continued to Auckland on the 29th. 12 covers were carried to N.Z. and posted on arrival. These have the 'VISIT SCENIC NEW ZEALAND' slogan postmark and signature of the pilot. Internal Flight: 1950, 1 Aug.
Tasman Empire Airways service inaugurated from Evans Bay to Rose Bay by Short S.45 Solent flying boat ZK-AMM "Ararangi" (Captain C. Griffiths), Covers postmarked WELLINGTON N.Z. 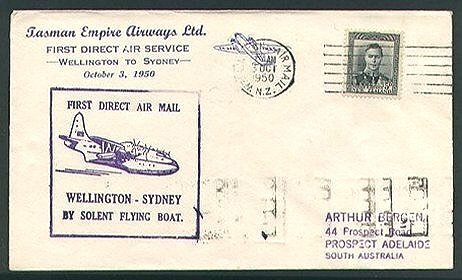 AIR MAIL 3 OC 1950 were backstamped SYDNEY 5.1SPM 3 OCT 1950. A large illustrated cachet was applied to covers at Wellington but no cachet was used on the Sydney-Wellington mail. By TEAL Short S.45 Solent (Captain C. Griffiths). The aircraft was chartered by the Department of Island Territories to return school children to the Island for the Christmas vacation and to carry mail. It flew as usual from Evans Bay to Te Whanga Lagoon and returned to Evans Bay. flight by K.LM. Royal Dutch Airlines Douglas DC-4 Skymaster PH-TCP "Overloon", bringing Dutch immigrants to New Zealand arrived at Whenuapai on 20 December. The Skymaster also carried mail from Holland including special K.LM. souvenir covers. PH-TCP left on the return flight to Amsterdam on 20 December carrying mail for Holland which including a quantity of return covers. By TEAL Short S.45 flying boat ZK-AMM "Ararangi" chartered by the Department of Island Territories to transport children home for the Christmas vacation. "Ararangi" flew from Mechanics Bay, Auckland to Evans Bay, Wellington where mail and passengers were picked up for the Chathams. The return flight was made the same day. Internal Flight: 1950, 18 Dec.
Flights for TEAL by QANTAS Lockheed Constellation VH-EAC "Harry Hawker". No cachet was used on the mail from Sydney but a large illustrated cachet was applied to mail at Christchurch on the return flight on the 20th.